Desperate Central Americans Are Fleeing to Other Countries Besides the US: Forced Displacement Statistics – Patrick F. Clarkin, Ph.D.
A gaping hole with this analysis is that it ignores the fact that the United States is not the only country that has seen an increase in asylum seekers from Central America. Instead, the pattern seems to be motivated primarily from “push” factors such as rising levels of violence in Guatemala, El Salvador, and Honduras than by “pull” factors in the United States such as easier border crossings. If Sessions’ claim were true, then we would expect that the increase in refugees and asylum seekers would only be seen in the U.S. But that is not what we’re seeing. For example, the number of asylum applications in Mexico increased dramatically from 2,000 in 2014 to more than 14,000 last year, primarily from Honduras. In the case of Honduras, homicide rates nearly doubled a few years after the President was removed in a coup in 2009. That led to a series of counter-protests, followed by “a wave of political violence that targeted a range of activists, including journalists and human rights defenders.” On top of that, instability allowed gangs and drug cartels to flourish, and a broken legal system has allowed men to kill women at some of the highest rates of femicide in the world, without fear of incarceration. 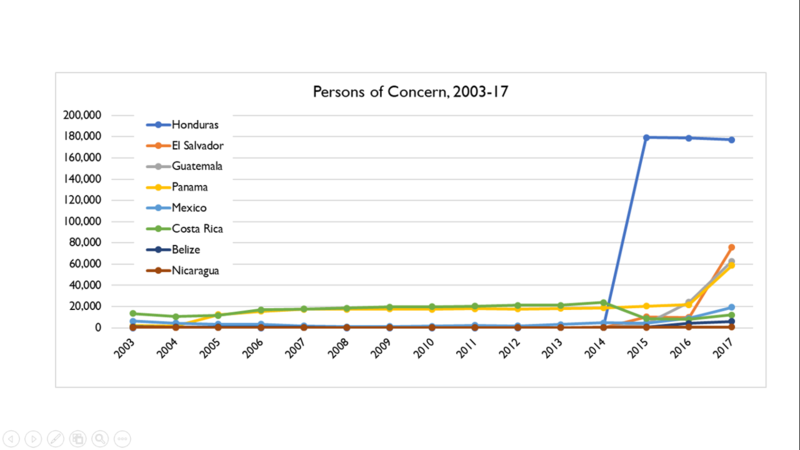 To get a better sense of all of this, I looked at data on “persons of concern” (PoC) from the region, using statistics from UNCHR (the United Nations High Commissioner for Refugees) from 2003 to the end of 2017. Data from 2018 were not available. This category includes refugees, asylum-seekers, internally displaced persons (IDPs), stateless persons, and a miscellaneous “other” category for distressed people receiving protection or humanitarian assistance for various reasons. To clarify, the graph below shows where PoC were located, rather than their country of origin. Figure 1: Persons of Concern in Central America and Mexico. The number of PoC was fairly steady in most of the countries from 2003-14, but nearly all of them saw a substantial uptick in the last few years, for internally displaced people (in the cases of El Salvador and Honduras), for people receiving protection (Guatemala), and for refugees and asylum seekers from other countries (Mexico, Panama, Costa Rica, and Belize). The obvious outlier is Honduras, where the number of PoC increased abruptly after 2014. The vast majority of these were internally displaced people, primarily the result of a rise in extortion and extreme gang violence, driving people from their homes. In fact, the numbers of PoC in Honduras were so much higher than its neighbors that I made a second graph below with it removed to see the other countries more clearly. At the opposite end of the spectrum is Nicaragua, which had a peak of only 737 PoC in 2017. However, violent protests this year may cause this number to increase. A friend who knows the region well told me that drug cartels have not gained a foothold there as they have in El Salvador and Honduras. In the case of Panama, another UN website suggests that up until 2016 most PoC there originated in Colombia, rather than other Central American countries. However, data on country of origin were not available for 2017 or 2018. That data would help clarify things. Figure 2: Same as above, with Honduras removed. The bottom line is that context matters. Americans, including Jeff Sessions, need to look beyond the United States to get a better sense of why and where people are fleeing. Given that nearly all countries saw an increase in PoC in the last few years, this is not unique to the U.S., and it certainly cannot be attributed to any supposed policy of immunity from prosecution if a person is accompanied by a minor. While the U.S. is a destination of choice for many people seeking asylum, it is clear that a complex range of factors has led to destabilization in Central America in recent years (particularly Honduras, El Salvador, and Guatemala), leading desperate people to flee to a number of countries, not just the U.S. This entry was posted in Forced displacement, Refugees and tagged Central America, El Salvador, Guatemala, Honduras, Jeff Sessions, Political Violence. Bookmark the permalink.